On Saturday, Adam's youngest brother married his girlfriend of several years, Heidi. She has always seemed like a member of the family, but now it is official! She has been Pinterest crazed throughout the wedding process, but all of her DIY projects pulled together to make a beautiful, fun, and original wedding. 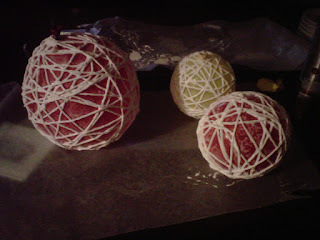 Several months ago she found some yarn ball ideas on Pinterest that she wanted to try out. I love to try out a new project, so I volunteered to try it for her! The original idea was to make some large yarn balls to hang from the ceiling as decoration like this photo here. Or this one. After some consideration, Heidi decided hanging things from the ceiling may not be feasible, so she had the idea to make them centerpieces. She wanted one large balloon and two small on every table. 14 tables. 42 yarn balls! AHH!!!! But I attacked the project with gusto! And lots of tweets. I probably read EVERY SINGLE blog tutorial about yarn balls on the entire Internet. These seemed so easy. But it WAS NOT this easy! This tutorial was more helpful. Because I had several fails. I kept having to go back to the drawing board. After reading all the posts, however, I have come up with the No Fail Recipe For Yarn Balls. The first few times I left them on my table. They had a flatter spot, but were OK. Just not conducive for doing 42 of them. Some of my other fails and successes. 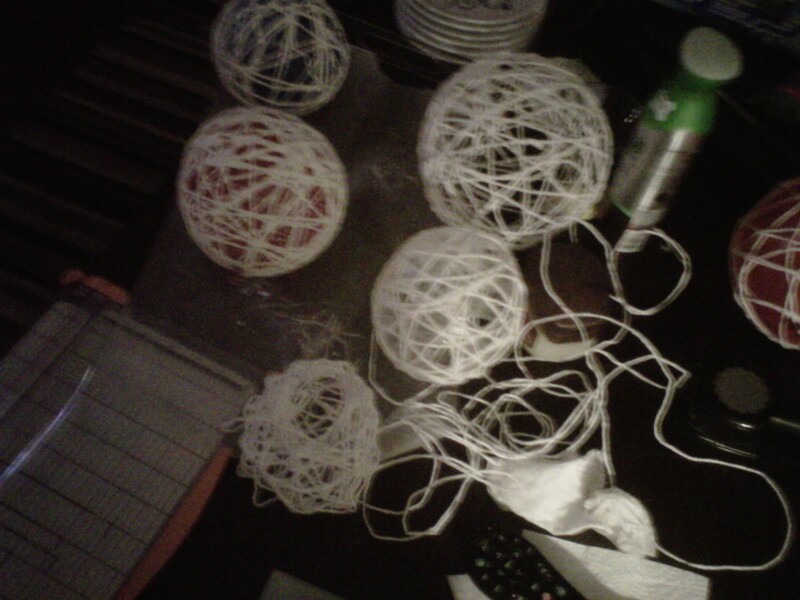 One totally fell apart and the strings are everywhere. 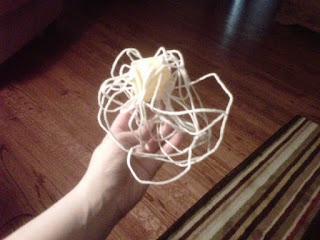 Another totally crumpled when I popped the balloon (pre-Vaseline). Another was very soft. So onto my fabulous NO FAIL Yarn Ball Recipe procedure. First, I ordered yarn balls from Amazon. These were the small balloons. These were the large balloons. I would recommend the large ones. They were great circles. I wouldn't recommend the small ones, they were really hard to make sure they weren't egg shaped. To make them not egg shaped took a lot of squeezing, blowing up, and letting air out. Blow up your balloons to the size you want. String yarn between two folding chairs (see picture at bottom). Lube up your balloons. The Vaseline REALLY helps ensure the balloons pop smoothly and the glue doesn't stick to the balloon. Just rube it all over until it is thick. You don't need a ton. Use safety pins to pin the balloon to your yarn string. Start feeding the end of your yarn into the mixtrure a little at a time so it doesn't get tangled up. Feed quite a bit, whatever you think you will need. Mush it around and make sure it is thoroughly coated. Start pulling it out by the end. Squeeze the yarn so the excess glue comes off. Pile the freshly squeezed glue off to the side until you get to the dry part. Hold the balloon and start wrapping vertically first. Then start on angles all around until it is all covered the way you want! Keep going until you have all of your yarn balls done! Or actually another important part. Wait at least 12-24 hours until they are completely dried. COMPLETELY. If they are still a little wet on the bottom, WAIT. No, it will not be OK. It will be floppy and flat. STOP. IT WILL NOT BE OK. Just wait a little longer. After they seem to be completely dry, pop your balloons with an extra safety pin. DO NOT do this near food. Not that I did that the first time....of course not. But in case you thought about it, little glue bit may go flying everywhere and your husband may say "WHAT the....?" But that wouldn't happen because you wouldn't do it near food. Pull the safety pins and balloon out of yarn ball. Now, I don't know if this is 100% necessary, but it helped me feel better about them being completely drying, but at the end I put them all in the oven for 45 minutes at 200 degrees. Take them out of the oven and put them on the counter. They will be a little soft until they cool off. Then they will be perfect! You can store them in a box or garbage bag safely. The yarn balls on the table at the wedding! I may have posed with them for more than one photo with the disposable cameras. Feed your yarn into the glue and get it all covered. Pull it out while squeezing off excess glue. Wait 12-24 hours to dry. Pop with safety pin and pull out through opening. Put in over for 45 minutes at 200. *You could use different colors of yarn for different colored balls. I am even thinking about experimenting with using two different colors on one. We shall see!